We are blessed to have a few glorious sunshiny days during the winter here in Texas, but we still have our fair share of nasty weather that makes it impossible to play outside. With two very active kids I’ve had to get creative to keep us (me) from going stir crazy. 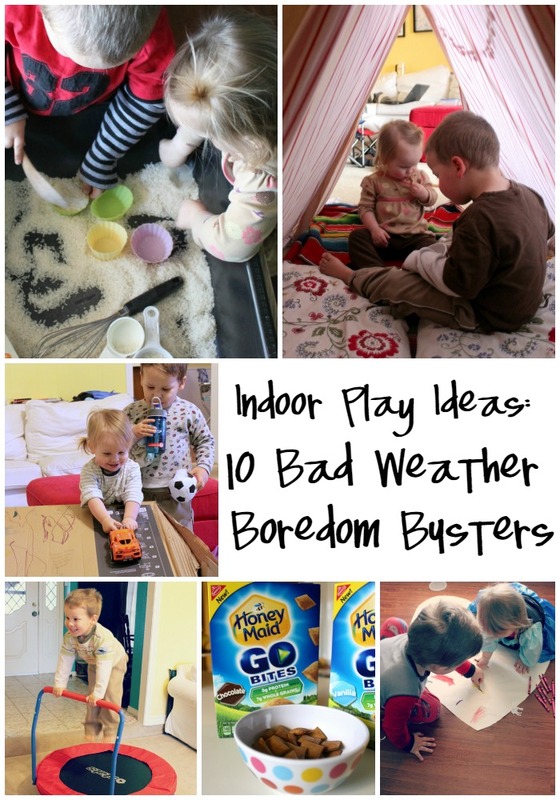 Today I’m sharing 10 ideas we use as bad weather boredom busters. Hopefully they will help you keep your sanity, avoid cabin fever, and have fun with your kids. 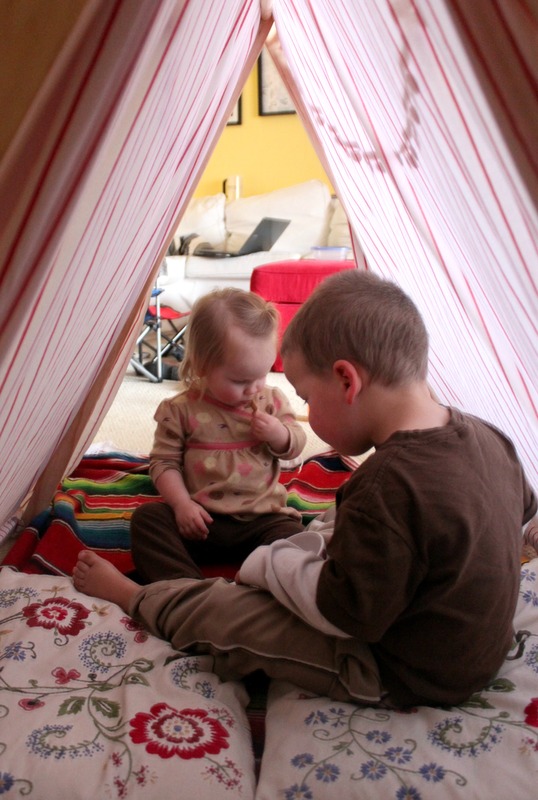 Fort Building – Our kids love nothing better than a good pillow fort or reading nook. Sometimes we build one using the couch cushions and blankets, while other times we bring out our DIY play tent. The new place to play completely changes attitudes, and can be a fun place to read a book or do a puzzle. Obstacle Courses – We arrange pillows, furniture, and toys to make an indoor obstacle course in our house quite often. I time the kids to see how fast they can go through and they run back and forth through the course endlessly. You can see one we set up to teach over, under, and in between here. Dance Parties – We turn on a favorite Pandora station and dance to get energy out and giggle at everyone’s dance moves. Sometimes we raid the dress up clothes first and have a costume dance party for an added element of fun. It’s almost as great a work out as your Zumba class. Here’s our Dance Through the Alphabet activity to try. Pretend Play – Dressing up in costumes and pretending to be something or someone else can open up a whole world of imagination for kids. Get in to costume and play with them. 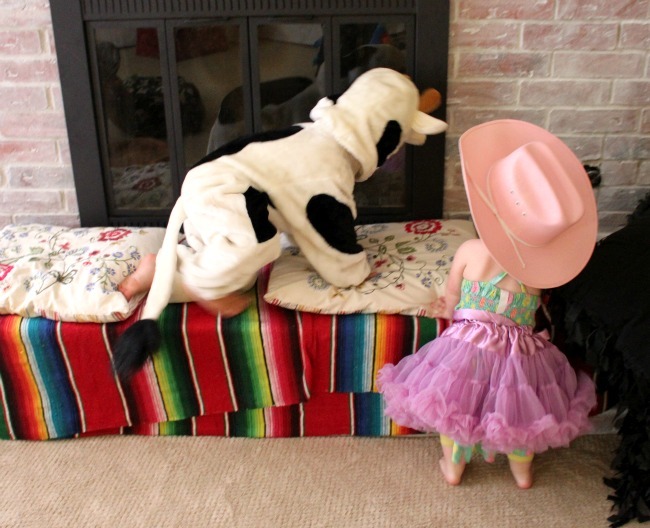 Cowboys, firemen, doctors, princesses, and knights, frequent our living room. Most mornings at least one kid has a costume on, and I love it. Sometimes we even wear them out to the grocery store. Snack Breaks – When we’re all grumpy and everyone is having a hard time, I usually realize it is past time for a snack. I love to bring snacks in to our pillow fort, because it adds a whole extra level of fun to snack time. 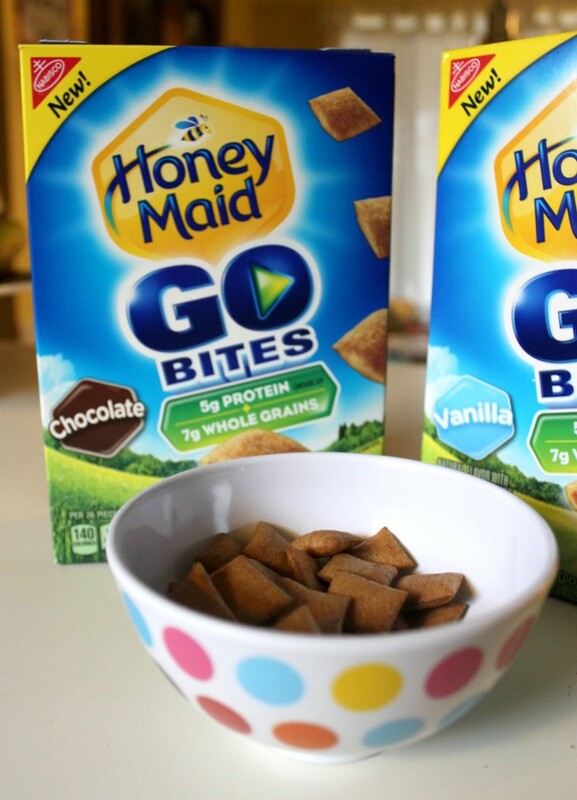 Our new favorite wholesome snacks are Honey Maid Go Bites, because they are mess free, contain 7g of whole grains and 5 g of protein per serving. They have no high fructose corn syrup or artificial flavors or colors. They have crunchy graham outside and delicious filling with either vanilla or chocolate flavor. We are obsessed with the chocolate. Jumping Games – Getting exercise in through active play can be a huge challenge during bad weather. We use our indoor trampoline to do these jumping challenges, but you can easily do jumping challenges across the living room floor or down the hall. Sensory Bins – We turn our DIY water table in to a sensory bin for a fun day of indoor play. 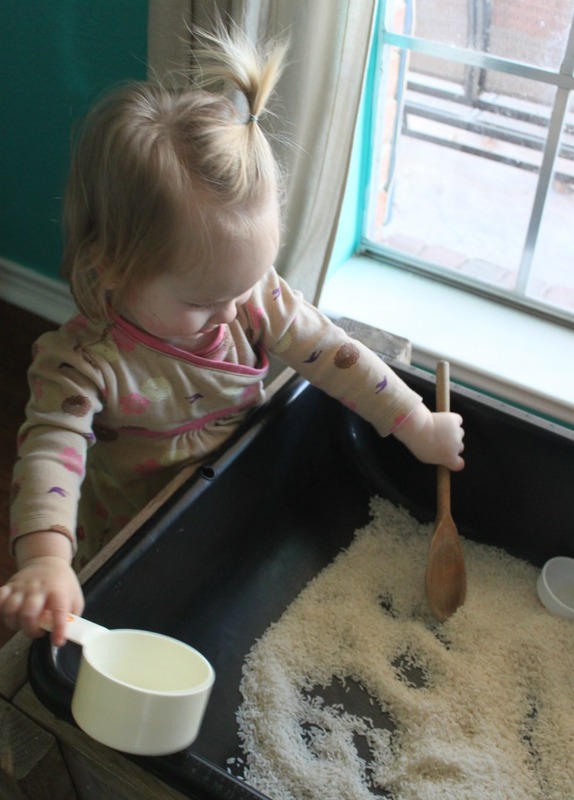 You can find our recipe for Taste Safe Snow Dough here, and our Simple Rice Sensory Bin here. Bath Tub Fun – We always take baths at night before bed, so when I run a bubble bath in the middle of the day the kids get really excited. Sometimes we paint with shaving cream in the bath tub, or just let them play for a longer time. My friend Crystal brings out the glow sticks and turns off the lights for a “Disco Bath”. 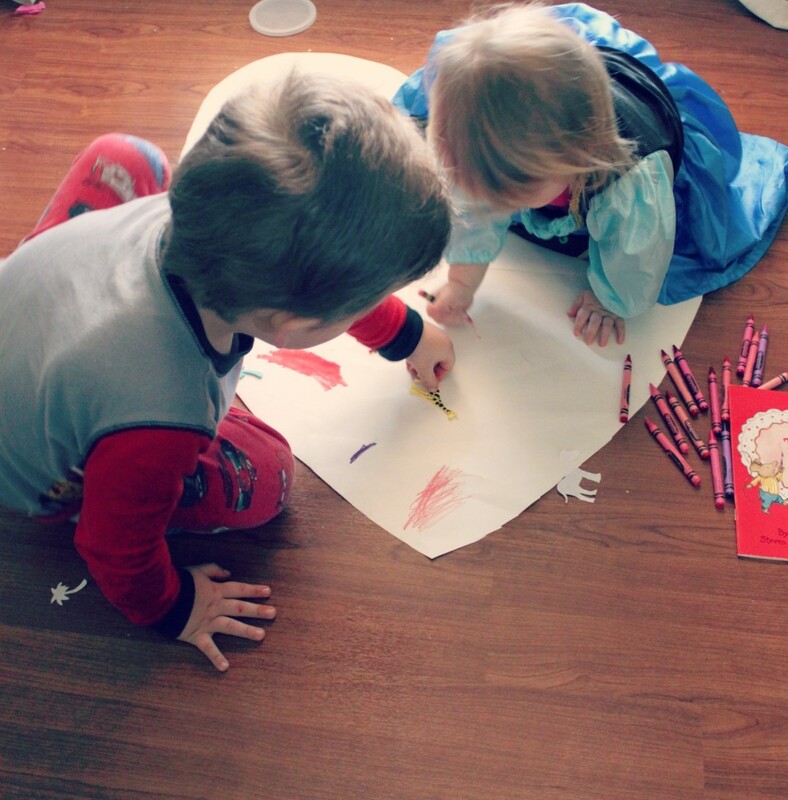 Creative Play – Crafts, finger painting, sculpting, and coloring encourage creativity and through boredom out the window. My kids love to show off their created projects. They are never Pinterest perfect, but they are lots of fun. Sometimes the most fun ideas are the easiest. Here are four fun ways to entertain kids with an empty cardboard box. Find more of our ideas for creative play here. Field Trips – When the weather is bad and we NEED to run, I take the kids to the indoor playground at the mall, a local church, or to our favorite museum. We are members of the Perot Museum in Dallas, and if you are ever in the area it is a must do. We budget for the membership because it gives us an indoor place to play all year round. Sometimes summer weather is more unbearable than winter here in Texas. 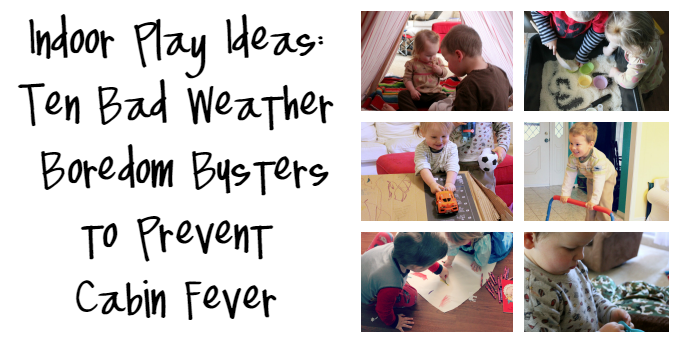 What’s your favorite bad weather boredom buster for your kids? OH MY GOODNESS!!! Your kids are adorable!!! 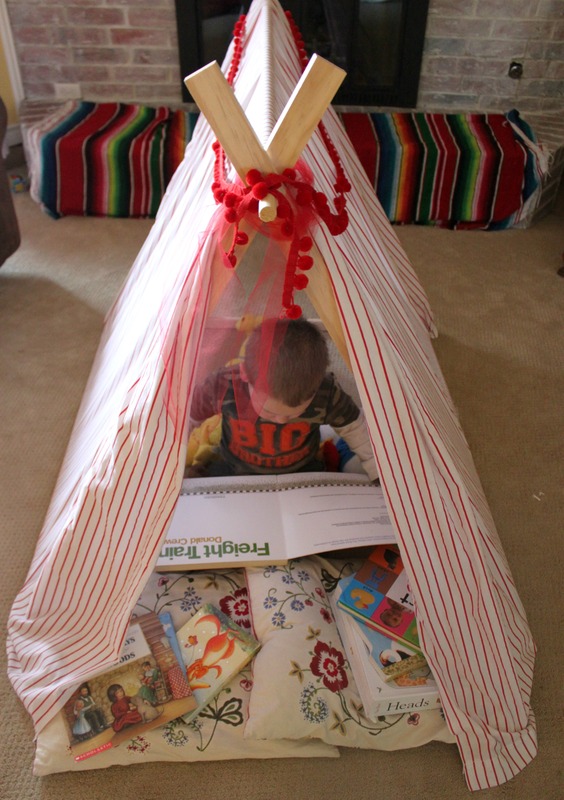 I love all of the winter indoor play ideas, how cute is the tent and the dress up play! The bites look so cute, I love graham crackers!